Review: The Star-Touched Queen is a beautiful story filled with beautiful prose, lush world-building and a just the right amount of stars to captivate readers of all tastes. With a touch of Greek Indian mythology, The Star-Touched Queen is a captivating story following Maya, a young princess with a cursed horoscope. While Maya may be a princess, she is feared by all around her. Her horoscope predicted death surrounding her, and as this is written in the stars, it is something she cannot escape. Feared by her own people, an outcast in the truest sense, Maya lives a life of solitude, with the except of the companionship from her beloved younger sister. With her sister she holds a pure love, sharing of stories of faraway places and unseen creatures – the only escape that Maya truly has from the hatred that surrounds her wherever she goes. Until everything changes one night. Feeling betrayed by her father, anger at her cursed life and trapped, one small event will change Maya’s world, and the stars forever. 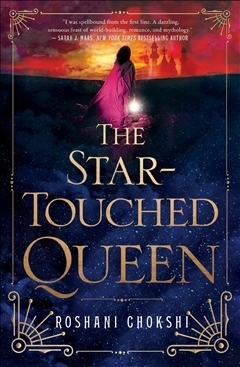 Filled with luscious detail and brilliant world-building, The Star-Touched Queen is elegant and lyrical, whilst still holding everything that will captivate you. Maya’s journey is filled with revelations and secrets, heartache and triumph, as she learns who she truly is. I respected Maya for the most part. She has spent her whole life being whispered about, being feared and never being truly seen for who she was. And while naturally she hated the stars that cursed her, she mainly took it all in her stride and focused on finding whatever scrap of happiness the stars left behind. But throughout her journey she really grew, and while she did have some moments of nativity, at the end of the day she knows who she really is, curse be damned. The romance is just about right. Just enough swoon, just enough classic love story and the right amount of mystery will make this romance one of your favourites. The story itself had a wonderful balance of secrets and honesty, passion and distrust, revelations and journey. It was tense and joyous and totally mesmerising. While parts of the story a little predictable, I found that the journey itself was magical. The writing itself was lyrical and elegant, while the story was beautifully enhanced by intricate and luscious details. I loved the world building in this story, however for my personal tastes, I wished some parts were fleshed out more. This book is a standalone (although there is a companion novel coming out), and as standalone I just wanted that little bit more. Because I am a big fan of intricacy and world-building, I want it every aspect – I want the story to be fleshed out completely, especially with something that is written really well. So yes, I could have done with more, however others will appreciate that this story is “overdone’. I cannot wait to see what A Crown of Wishes brings us. With some beloved characters and magical storytelling, this companion novel is high on my wish-list! Lovers of lyrical writing, stories inspired by folklore and magical storytelling with just the right amount of sass, this book is for you! So glad to hear you enjoyed this book! While this book didn’t blow me away either I did quite love the writing!